The robot research laboratory at Chonnam National University has developed a robotic plant that humidifies, oxygenates, emits aroma and moves. All characteristics were copied from normally grown for ornamental plants. Being 130 cm tall and 40 cm in diameter and consists of a pot, a stem, and five buds of a flower reminiscent of a rose of Sharon, the plant is live-like for it also emits oxygen, moisture, and aroma. But it also responds in various ways to stimuli from outside, such as approaching persons, music or light. 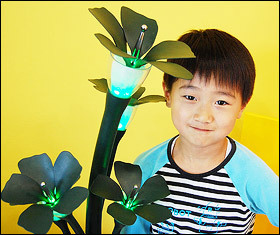 When a person comes within a 40 cm radius of the flower, its supersonic sensor perceives the approach, the stem bends towards the person, and the buds come into full bloom. When the person leaves, the plant returns to its original state.